How to protect your finished sewing project by giving it the final touches when pressing? BERNINA Brand Ambassador Diane Gloystein reveals her trick. How often have you used an iron, only to discover the soleplate has left a mark on your beautiful project? 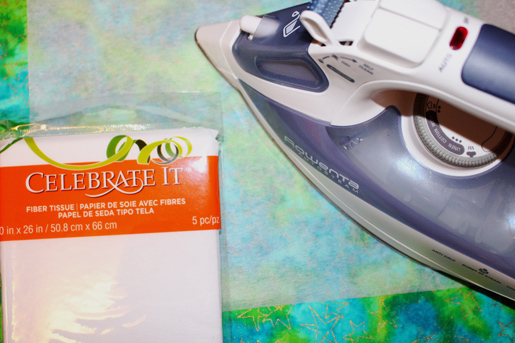 Have you ever touched an iron to fabric and only to melt it? If you’ve ever experienced the fabric developing a sheen where you don’t want it, you know what I’m talking about! A press sheet prevents these problems from happening. Today I was at Michael’s craft store (yes, the chain), and discovered a “Fabric Tissue” paper in their gift wrapping section. It doesn’t easily tear. It breathes. It’s thin enough that you can see what’s going on beneath it. And it withstands high iron temperatures. For $3.99 you’ll get five big sheets which are about the right size when cut in quarters. It’s the perfect, disposable press sheet! Try it out and leave a comment if it works for you! I buy the cheap dish towels at WalMart. There are 5 in a package for $4.99. They work excellently! Really, they are just large muslin squares.